Ever ready to embrace the ‘new’ and the quirky, Japan’s off-kilter culture also extends to its hotel offerings. Admittedly, not every new venture runs smoothly… Only recently, Henn na Hotel in Tokyo fired its staff for being incompetent – but the most notable thing in this case was that the ‘staff’ in question were robots! With limits on space forcing developers to build skywards, Tokyo’s residents have always embraced intimate living areas. Capsule hotel Nine Hours allows guests to book bed-sized pods for between one and nine hours, providing an efficient way to catch some shut-eye, whether on a short lay-over or as part of a longer stay. Towels, loungewear and tooth brushes are provided in each locker. How: Capsules from Y4,900 (approx £36) room only overnight; a one-hour nap costs Y1,000 (approx £7) Visit ninehours.co.jp/en/. Passengers board this five-star train on platform 13.5 at Tokyo’s Ueno Station, by walking along a red carpet. The expansive suites include opulent touches, such as traditional Japanese baths made of aromatic hinoki cypress wood and Swarovski binoculars for staring out of the panoramic windows. Michelin-star chef Katsuhiro Nakamura oversees the kitchen, offering a menu based on the four seasons and inspired by areas the train passes through. How: One, two and three-night trips from Tokyo Ueno cost between Y320,000 and Y940,000 (approx £2,300-£6,800) per person, full board. Visit jreast.co.jp/shiki-shima/en. Curling up with a good book at bedtime is a universally pleasurable experience. 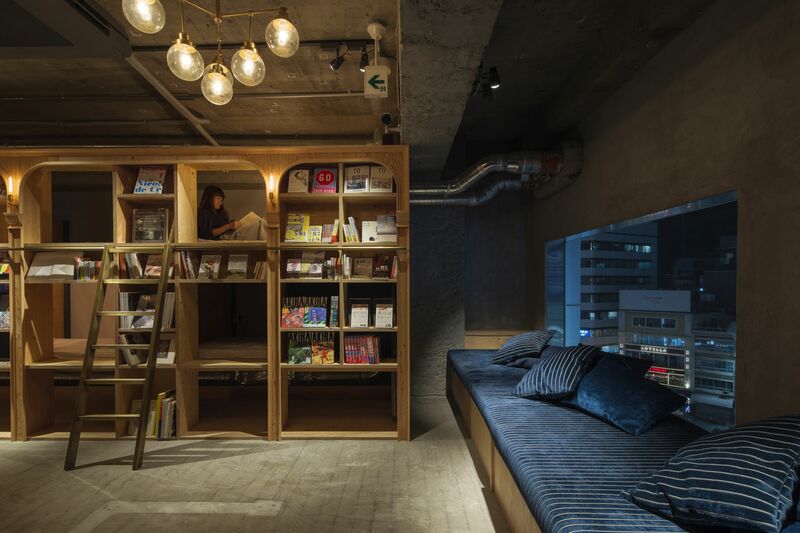 No wonder, then, that Book and Bed – an ‘accommodation bookshop’ – has placed its hotel beds between shelves holding over 1,700 books in Japanese and English. Beds either take the form of long sofas or bunks. The bibliophile’s dream is located in Ikebukuro, an entertainment district of Tokyo, and also offers daytime stays. How: A standard bed (without tax) is Y4,600 (approx £33) per person, per night. Between 1-9pm on weekdays, flat charge of Y1,620 (£12) for daytime accommodation. Visit bookandbedtokyo.com. For art lovers, Naoshima is sure to be worth the journey, as the small island is home to Japan’s highest concentration of galleries. On the southern tip is Benesse House Complex, which is both a museum and a hotel. Art is displayed in the museum’s galleries and is also scattered throughout the rooms. Expect to find works by Andy Warhol, David Hockney and Jasper Johns – not to mention Yayoi Kusama’s iconic Yellow Pumpkin, which stands on a pier facing the hotel. How: Museum rooms from Y38,000 (approx £275) in low season. Visit benesse-artsite.jp/en/stay/benessehouse/. Keio Plaza has all the hallmarks of a classic, prestigious Tokyo hotel. Located in trendy Shinjuku district, it boasts a team of immaculately dressed staff, and guests are welcomed by the sound of live koto music from a kimono-wearing band. The hotel’s craziness lies in four suites devoted to Japanese cartoon sensation, Hello Kitty. The anime cat adorns not only the walls but most items of furniture too. How: Hello Kitty Room from Y31,500(approx £224) per night. Visit keioplaza.com.